You've seen my ripped jeans on here before, you've seen both pairs on Instagram and if you watched my November favourites video you'll have known this post was coming... 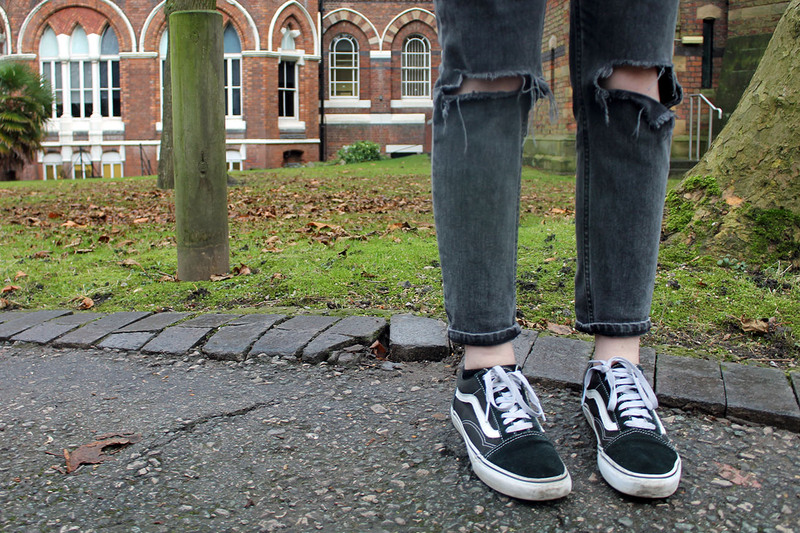 I have a love affair with the ASOS farleigh jeans and I'm gonna damn well blog about it. Like many of you reading, from the ages of 12-20 the only jeans I would wear had to be skinny. And when I say skinny jeans I mean cutting-of-your-circulation skin tight. My favourite pair out of the many I've owned throughout my teenage years were the River Island Lana jeans. Forever and ever, my favourite skinny jeans. But times have changed, my style has moved on, my waist has widened, I need some room to BREATHE. On a search for alternatives, I found the farleigh 'slim mom jeans' on my favourite site of them all, ASOS. Now I know many people are averse to mom jeans, you either like them or loathe them, but give these jeans the benefit of the doubt. I'd never actually describe them as mom jeans, they're halfway between that and classic high waist skinnies. Maybe what some brands would call 'girlfriend jeans' (don't get me started on this whole thing). The ASOS farleigh jeans are perfect. They have the perfect mix of looks and comfort, the look doesn't compromise the comfort and the comfort sure as hell doesn't compromise the look. I bought my first farleigh jeans in the washed black rinse with the busted knees maybe a year ago now. They're still keeping up pretty well considering I wear them at least twice a week. So last month I thought it was about time I bought a second pair. I mean, once you find the pair, you're set for life. You know? I used to be anti blue jeans, I liked my black pair and that was it. But with the persuasive styling of Megan Ellaby I went for it. I bought my second pair of farleigh jeans in the Gwen mid stonewash blue and it's safe to say I'm in love. They've since stopped making that wash but the light stone wash farleigh jeans look spookily similar. I may or may not have worn them for three days straight once they arrived. I don't even care if that's gross they're too pretty for that to even matter. As I hope these pictures show, the ASOS farleigh jeans are pretty versatile. These two pairs alone look completely different and can be styled in dramatically different ways. You can dress them up or down, with flats or heels, for uni or drinks. And that's what makes them such a staple in my wardrobe. So thank you, ASOS, for making the best jeans I've ever had the pleasure to put my legs in. Shop the farleigh jeans here to find your fave wash - and no, this post isn't sponsored, I just love these jeans that much. (But ASOS if you're reading this hmu I'm a big fan). 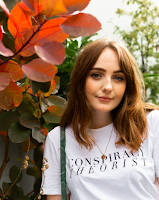 The Asos Farleigh high-waist slim-mom jeans look fabulous on you, and I like the striped top and the jumper you styled them with in your beautiful outfit photos. Another superb post Allie, there's those snake boots again, love them, love your smile, love your posts, love the locations you choose. Love the photo's, would be nice if you put a little "photo's by" credit, whoever he/she is they're doing a smashing job! Oooh Allie, you're rocking these outfits! I think you styled both pairs of jeans perfectly and they definitely suit you, that's for sure. 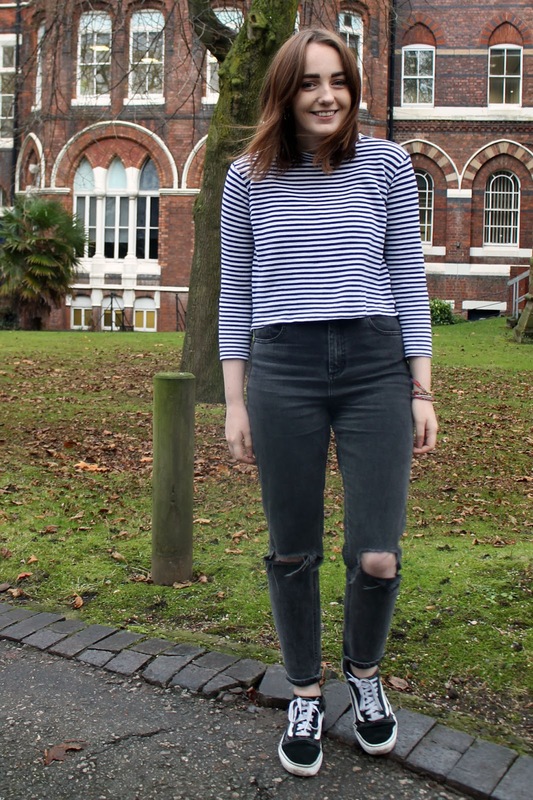 I'm obsessed with my Topshop jeans, but maybe I'll have to give ASOS a little look next time! Both these look gorgeousssss on you babe ! You've definitely convinced me to pick them up - I used to be the same with strictly skinny - now I'm obsessed with Mom jeans ! - Also - we are exactly the same when I comes to blue jeans ! I was strictly a black jean girly but recently I've been loving blue! I got a waist 28, which is the perfect size for me with tucking in t-shirts or jumpers, and I'm a size 10 so they're pretty true to size. The leg on the blue ones is 30 which is a little short on me so I'd recommend getting 32 and you can always hem if needed! Hi Allie! I got a pair of high waist jeans from Dr Denim and I love them, except they're bit stiff around the waist. The composite seems pretty similar to the Farleigh, 98-99% cotton and 1-2% stretch. Did your jeans soften/stretch with time or should I expect them to always be this structured? If the farleigh is stretchier, I might return my dr denims to asos and get them instead! These jeans are fairly soft I'd say, but still like a "proper jean". I find them really comfortable!